Peppermint was widely used by teh ancient Greeks and Romans, and may have been cultivated by the Egyptians. The term "mint" is from the Greek Mintha, a mythological nympth transformed into a plant by the goddess Persephone after she learned of her husband Pluto's love for her. This oil is 100% pure. Warnings: Keep out of reach of children. Not for internal use if undiluted. Do not use during pregnancy. Fun fact: It's believed that the genus Mentha was named for the mythological nymph Minthe, who, according to Roman legend, was seduced by Pluto, then turned into a plant by his jealous wife. Pluto then turned Minthe into an herb, to be valued by generations to come. 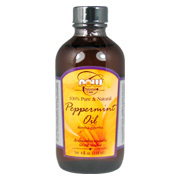 Peppermint is one of the most useful and beloved essential oils. Refreshing, cooling, uplifting, and restoring, peppermint has a variety of therapeutic uses. Used extensively in both Eastern and Western medicine for everything from indigestion to diarrhea, headaches to tired feet, and toothaches to cramps. Peppermint is also a big favorite among the food industry, and can be found as a flavoring agent in gums, candy, ice cream, and pastries. However, peppermint really shines in aromatherapy, as its fresh, comforting scent soothes and relieves all sorts of ailments, both mental and physical. Mixes well with: Basil, eucalyptus, geranium, grapefruit, juniper, lavender, lemon, myrrh, pine, rosemary, spearmint, tea tree, and wintergreen. Safety Information: Avoid if pregnant or breast feeding. Do not use on babies or small children. May cause irritation to sensitive skin, however it is rare. Do a patch test, first, before applying in large amounts. Do not use in baths. Should not be used in conjunction with homeopathic remedies, as it will act as an antidote.